Whether you're a beauty enthusiast or a basic beauty routine gal, chances are you have lots of makeup and hair products floating around your home or bathroom. There are many ways to store these products, and below are a few simple hacks to keep things easy and organized. Makeup enthusiast, Jillian Bangel, suggests using acrylic organizers with several drawers and openings for palettes, lip products, and other makeup items. But her real secret hack is her brush organizer on the side. 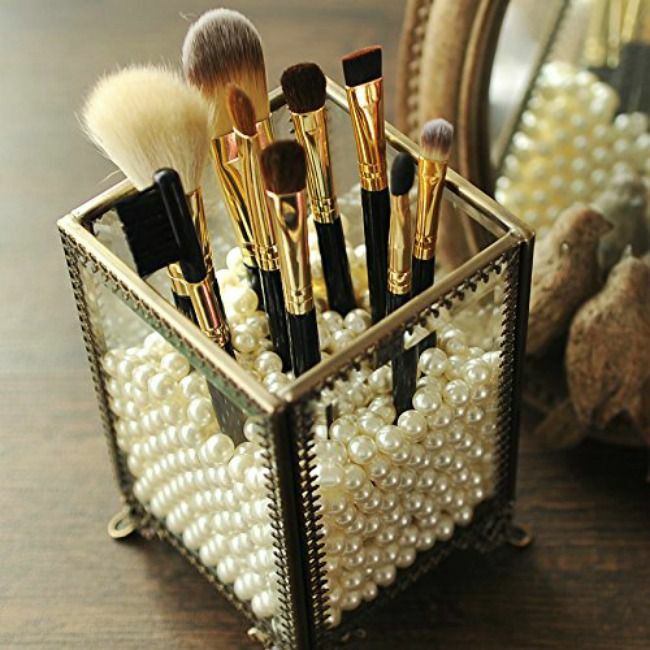 This pretty glass box and with faux pearls keep her brushes upright and from falling into each other, which make it easier to find the smaller brushes within the larger collection. If you want to hack this method and DIY it, you can use any pretty container and large beads or faux pearls in the style and color you love most. Bangel goes on to say putting her beauty items in the order she uses them is key: "I then organize my organizer by type of palette. The bottom drawer is eyeshadow palettes, and the drawer above that is blush and contour palettes. Then I organize the other drawers based on their purpose (one drawer for highlighters, two drawers for lips, one for primers, one for bronzers), and then on the top openings I have all my mascaras, eye tools (liner, shadow brushes, brow pencil), and setting spray. The end!" Find the method and containers that work for you and your morning routine, and get crafty when it comes to setting up your space. Bathrooms are the typical space for many people's beauty routine. However, they tend to be the smallest and least storage friendly room in the house. To save yourself some space, try organizing beauty products over the door of the bathroom or linen closet. You can use an over-the-door shoe organizer, like this one from Bed Bath & Beyond, for larger items like bottles of shampoo, shaving cream, hair spray, or even curling irons (once they've cooled). You can also keep those little samples and travel sized beauty products organized by type so they're easy to find for your next vacation. Use a label maker or adhere stickers with the type of product to the front of the pocket. Get creative and use over-the-door solutions from other rooms in the house. Try a kitchen pantry organizer (the spice shelves are great for nail polish), or an organizer with several baskets, or an accessories organizer. Just because they weren't designed with beauty products in mind doesn't mean you can't hack it! One of the best ways to keep beauty products organized is in containers where you can easily see which products are inside. This rule applies at home and especially on the go. Save yourself from digging through lots of zipper pouches and trying to remember which one the blush and which one has the brushes. This Grotta Voyager Toiletry Bag from Hudson + Bleeker can really come in handy because of its multiple compartments and unique features. Stash your beauty products like primer, foundation, and other face items in one of the clear vinyl cases. Then pack eyeshadows, blush, and other makeup items in the other. It's easy to see everything without having to dig around and search. Plus, the cases are removable so you can double the storage space (or tote the pretty pink case around as a purse - it's that cute!). Not to mention, the sweet little Bon Voyage pouch is detachable and can stash the things you want to keep hidden in a shared hotel bathroom, like hygiene products. If you want to DIY the clear compartments when traveling, try resealable plastic zipper bags in several sizes to suit your beauty organization needs. You can separate your items into smaller baggies and put them all into one large one. The only thing left is to pick your travel destination! Did you think that shoe cabinets and organizers are just for shoes? Think again! These slim cabinets, like the Hemnes Shoe Cabinet from Ikea, feature a slim design with doors that tilt open. Because of this, you can place this cabinet nearly anywhere, including into a small bathroom. Plus, because the doors tilt open, you can keep items inside stowed there upright. This is a lifesaver for beauty products that come in bottles or cans like hairspray, dry shampoo, or other items. In fact, because the back of the cabinet is slatted and the back of the shelves are vented, you can easily place this cabinet over a plug and place a surge protector with several outlets inside. Stow your hairdryer, curling irons, and wands inside, plug them in, and just hit the switch on the surge protector when you're ready to work! In the small top drawer, keep your hair ties, bobbi pins, brushes, and combs within arm's reach. Keeping your palletes of makeup in the latest hues and color combinations organized can be tricky. Instead of stacking them or throwing them into a drawer, try sorting them standing up. You can store them like little books with the spine and title facing out, using surrounding items as bookends (or use real bookends!). You can order them by brand or alphabetically, whatever is easiest for you. Or, try something like the Acrylic Palette Organizer from The Container Store. For a more DIY hack, borrow an idea from the office supply shop and use a letter sorter, like this stylish Yamazaki Nest Letter Sorter in white. Choose a color or design that fits your style. Are you swimming in a sea of beauty products? Are your containers overflowing? Maybe it's time to say goodbye. Go through your collection and do some spring cleaning. If there are items that have expired, are broken, or you don't use give them the heave ho. This way you won't be wading through barely used bronzers or crumbling mascaras in your morning routine. You'll save time and space! One brilliant hack for getting organized is selling unopened product, perhaps if it was given as a gift or you no longer use a particular formula.You can even sell old hair tools that you never use! This way you’re getting rid of the product and making a few extra bucks doing so. Try Mercari, the safest and easiest new app to buy & sell goods. Mercari allows users to easily sell anything unwanted that they might have, including unopened beauty products! The app is super easy to use, and listing something can take under 3 minutes. They also provide the shipping label for you, so it is really is a brilliant hack and an easy solution to create more space and ease in your beauty routine. Beauty storage can be difficult because you need all of the items in one easy to reach place, but only for a small portion of the day. So sort your hair and beauty products onto a rolling cart, like this Dunloy bar cart from Wayfair. It's especially helpful if the cart has wheels (and a cute design). You can roll the cart into the bathroom or bedroom (or wherever you get ready) and then roll it away into storage again. Everything can have its own place on the cart. In fact, if the cart has wine bottle storage, use that for hair tools. You can always try using some of the containers mentioned above to organize small items. And we won't blame you if you keep a bottle of bubbly on board, too. If your vanity has drawer space, keep your small items from shifting around and getting lost with trays. You can purchase beauty organization trays, or borrow some items from the kitchen. Try using ice cube trays with square sections to keep your single eye shadows in perfect order. You can even use those ice cube trays that make long, skinny ice for water bottles for eye shadow duos or eye liner pencils. If you have more space and longer items, try a silverware tray to organize makeup brushes, lip pencils, or mascaras. Whether the trays are plastic or silicone, the best part is that they're easy to remove from the drawer and clean. Eye shadow and other makeup items are notorious for making a mess, and part of organization is cleanliness. Pop out the trays every once in awhile and give them a quick rinse with soap and water, dry them, and return them to the drawer. Are you always losing bobbi pins and misplacing hair ties? You're not alone. It seems like those tiny (but very important) hair items go missing all the time. To wrangle yours, use a votive candle holder. Place the bobbi pins inside so they're easy to reach. Then, corral your hair ties either into or around the outside of another one. You can buy this David Tutera™ Gold Spotted Plating Glass Votive Cup solo or in a pack of 12 from the arts and crafts store, Michael's. Use some for storage, and some to set the mood with candles. You can even place several throughout your home, any place where you may take down your hair to relax. Because they're candle holders, they can blend in with the rest of your decor, and you'll always have bobbi pins and hair elastics on hand! Do you mix up your look from time to time? Tiffany Herrmann, founder of Sheree Cosmetics, an all natural, cruelty free and paraben free line of lipsticks, eye shadows and false eyelashes has some tips. She organizes her eye shadows that are sold in a magnetic single pan, 35mm, with a palette from z palette. It works with any magnetic single eyeshadows so you can curate the palette with seasonal colors, or those you're bringing on a specific trip. Swap them out as necessary and stow away the off-season colors in their own containers until you need them.